The distinct roofline of Pleated House not only pays homage to midcentury architecture, but also makes room for clerestory windows that flood the interiors with light. 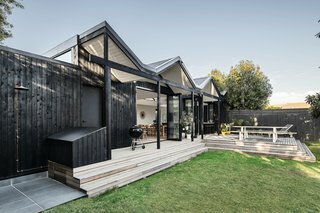 Recently, a couple in possession of a modest, single-story, clapboard home in a Melbourne suburb approached Megowan Architectural for a much-needed refresh. "Floors were uneven, plaster was cracking, the back of the house was falling away, and the layout was awkward with little to no connection to the large rear yard," says the firm. The architects responded with a design that revolves around a few "impactful gestures," namely a rear extension topped with a distinct, pleated roofline and clad in charred cypress. 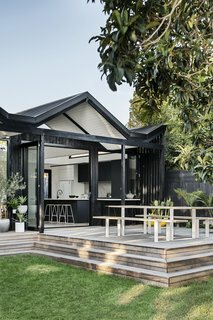 "Given one of the clients was a roof plumber by trade, a simple, flat-roofed box out the back just wasn’t going to be an option," say the architects. 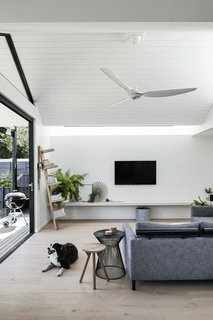 "The brief was to efficiently and cost effectively transform a light-starved weatherboard into an open and modern home with a good connection to the rear garden and a relaxed yet refined feel," says the firm. The owner charred and oiled the shiplapped cypress siding himself. The firm lightly reorganized the front of the house to accommodate a master suite, a new bathroom, and two bedrooms, then grouped the living areas in the addition. The entry was aligned with the new rear extension, so that the backyard can be glimpsed from the front door. 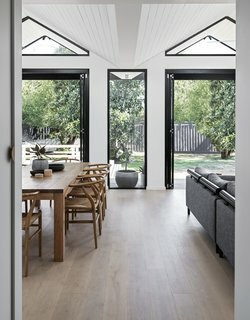 The bold form of the roofline and the geometric windows were balanced with a streamlined approach to the interior, which is composed of light-washed oak floors and white-painted boards at the ceiling. 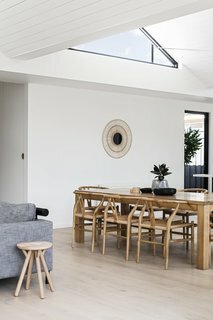 "The folded roof was implemented to allow for clerestory windows to let light deep into the living spaces of the extension from the north, east, and west," say the architects. "The six different shaped clerestory windows were a key strategy to addressing the day lighting issues inherent in a south-facing rear yard." 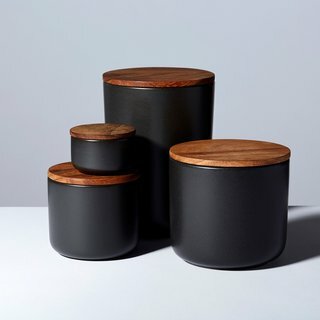 We can't contain our excitement about these quintessentially modern stoneware containers. 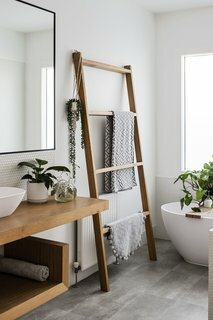 Sleek, clean-lined, simple, and (don't forget) practical, these well-proportioned accessories could be the poster children for our most beloved aesthetic. Turns out, you don't have to branch out too far to make a big statement. 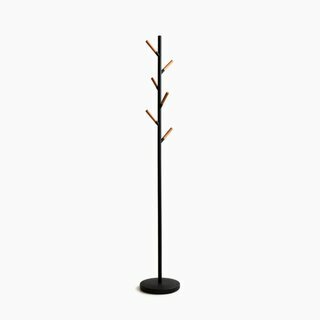 This sleek, simple coat tree collects your outerwear treasures with streamlined class. And when its work is done, its strong, black silhouette makes an impact as timeless as a tree. French bistro flair, at your service. 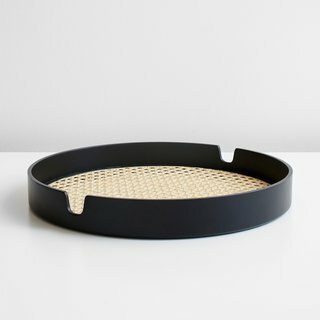 Ferry your drinks and snacks anywhere, dining room to patio, living room to the kitchen, with this serving essential. It shows off French wicker in a new way, allowing the material’s strength and tidy appearance to shine forth, simply. 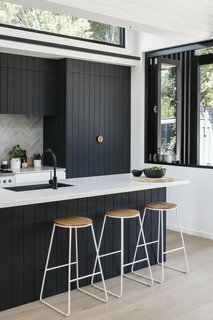 The dark kitchen cabinetry is a nod to the exterior, "as the pattern of the shiplapped cladding informed the grooves of the kitchen joinery," says the firm. 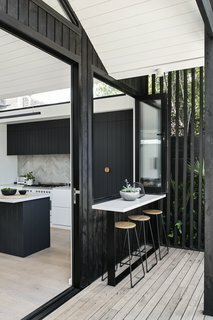 A pass-through serving window positioned between the kitchen and deck facilitates indoor/outdoor flow and makes grilling and entertaining easy. Light-colored Belgium stone tiles in the bathroom foster consistency in the interior palette. The bold roofline was inspired by iconic midcentury modern forms found in the work of Wexler, Berkus, and Koenig, as well as the the bathing boxes at Port Phillip Bay. "After photographing the house, we all sat down around the servery over a glass (or two) of wine and shared travel experiences, building industry war stories, and discussed the renovation," says the firm. "It was very gratifying to hear and see that the space really fit the clients well. The space was comfortable, laid-back, and yet worldly, just like the clients themselves."